Summary: In Revelation 17:18, John is told that the woman is the great city that rules over all nations. What does this statement mean? 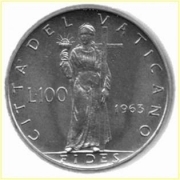 Coins minted in Vatican City often bear the inscription CITTÁ DEL VATICANO, which means “City of Prophecy.” The Church of Rome thus applies the title of “City” to its structure. The full title of the Vatican State is Stato Delle Cittá Del Vaticano, which is the combination of church and state. There is also a woman on the reverse side of the coin, and at her feet is her title, FIDES, which means faith. This woman is symbolic of the Roman Catholic Church, which claims power over all governments on Earth. And the woman which thou sawest is that great city, which reigneth over the kings of the earth (Revelation 17:18). The fallen Church, represented by the woman, must therefore be a universal Church. 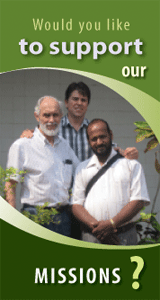 The word "catholic" actually means "universal." The Roman Catholic Church claims to be the universal or worldwide Church and, as we have seen, she claims to have authority over all nations.